DENVER -- Peyton Manning failed to get the Broncos into the end zone in seven possessions Saturday night, when Denver rode its stifling defense and good ground game to a 19-12 win over the sputtering San Francisco 49ers. All that rest has turned into rust for Manning, who was doomed by protection problems and an interception in the end zone one week after penalties and dropped passes kept him from finding any rhythm. Manning was 14 for 21 for 124 yards and was sacked three times, twice by linebacker NaVorro Bowman. Manning isn't expected to play against Arizona next week, meaning he'll head into the regular season having directed just two scoring drives - both of them field goals - in 11 possessions this preseason. At least he'll have two-time Pro Bowl guard Evan Mathis by then. Mathis signed this week, giving the Broncos' young offensive line a much-needed addition of experience. The 39-year-old QB has taken some forced time off this summer, sitting every few days because of his age and to get longtime backup Brock Osweiler some work. GM John Elway says he'll take a rusty Manning early on over an exhausted one down the stretch. Juwan Thompson scored the game's only touchdown on a 1-yard run with 2:04 left that erased a 12-11 deficit and capped an 80-yard drive engineered by Osweiler. He also ran in the 2-point conversion to make it 19-12. The Broncos (3-0) reached the 20 three times when Manning was in the game but only managed a pair of Brandon McManus field goals. Cornerback Kenneth Acker intercepted Manning's underthrown pass to Demaryius Thomas in the end zone. Bowman, who missed all of last season after a devastating knee injury in the NFC championship game in January 2014, had seven tackles, including five on Denver's second drive, when he also had both of his sacks. The 49ers (1-2) played without linebacker Ahmad Brooks, who was placed on leave Thursday after being charged with misdemeanor sexual battery, the latest issue for a roster that's had major change in the offseason. Colin Kaepernick didn't complete a pass until the final minute of the first half, which ended with Denver ahead 8-3. He was just 2 of 6 for 13 yards and scrambled three times for 53 yards. 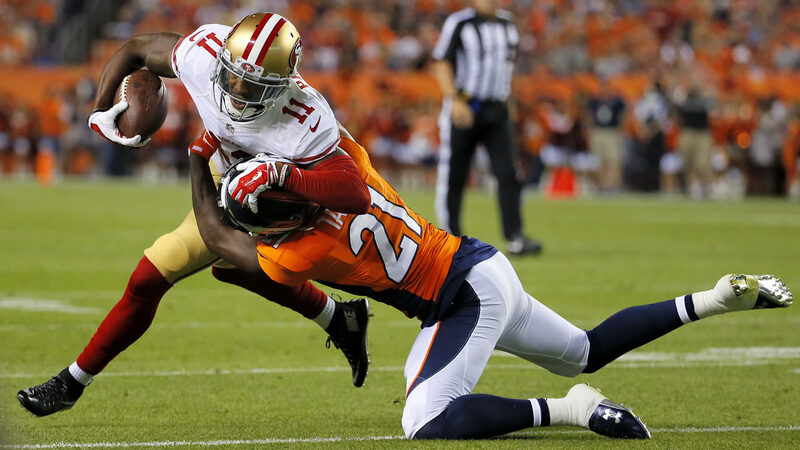 DeMarcus Ware sacked Kaepernick in the end zone for a safety in the second quarter, the highlight of another stellar outing by Denver's defense, which has allowed just six points in 11 drives. Corey Acosta was good from 50, 38 and 29 yards in the second half, the last one giving San Francisco a 12-11 lead with 5:43 remaining.